"Reporters Are Looking for YOU!" Zooms to #2 Spot on Amazon PR Books! 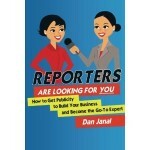 Home/Authors, Book marketing, Publicity, Publicity thought leadership/"Reporters Are Looking for YOU!" Zooms to #2 Spot on Amazon PR Books! My new book, “Reporters Are Looking for YOU!” zoomed to the #2 spot on the Amazon best-seller list for public relations books – on its first day of “soft launch” to my email list members! Imagine what will happen when I tell the rest of the world about this book, which shares my publicity tips on how to pitch reporters and reply effectively to their leads on PR LEADS, ProfNet and other lead services. That’s “New Rules for Public Relations,” by David Meerman Scott, a perennial best seller that is a must read!